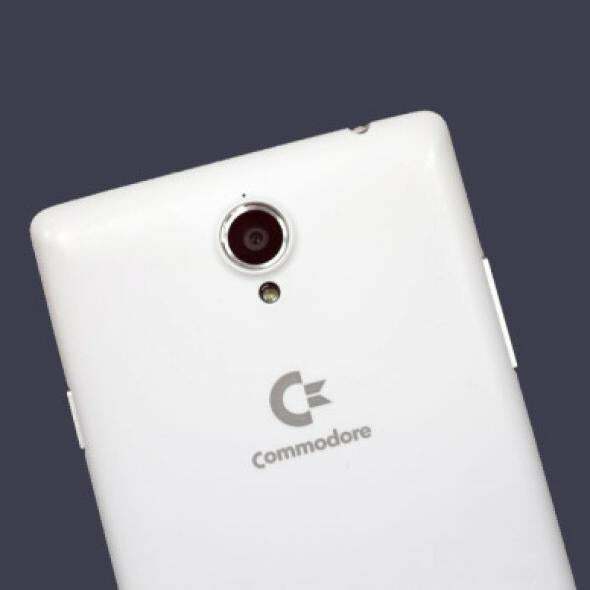 Commodore: The PC company of the 1980s is back with a smartphone. From the long-dead corpse of Commodore rises this zombie smartphone. Commodore, the name that helped usher in the PC revolution, is back. With a phone. For those of you too young to remember, Commodore was a hot company in the mid-1980s. It was a leader in personal computers, shipping thousands of Commodore 64 desktops daily. Guinness has named it the single biggest-selling computer ever—the company sold as many as 17 million of them—and the brand name is still widely remembered. Still, the company went bankrupt in 1994, and the brand saw several fuzzy changes of trademark ownership over the years. Rumors have swirled around the phone for months, driven in part by design renders published online. With its release imminent, I met with the guys behind it and tried out a prototype. Perhaps the biggest question: how a company that folded two decades ago can release a new product. That’s a long, strange tale. Jack Tramiel founded Commodore International in 1954 in Toronto. After launching the PET in 1977 and following up with the VIC-20 and Commodore 64, he left. The company slowly withered and folded in 1994. A buyer snapped up its assets, including 47 patents related to the company’s Amiga line, but the Commodore trademark changed hands several times. In 1996, the German PC conglomerate that owned the rights to it filed for bankruptcy, and the Commodore name bounced around some more, going through two more bankruptcies. Two years ago, a federal court ruled that the trademark belonged to Commodore Holdings B.V., a Dutch company that has been silent ever since. That’s where things stood until March, when Massimo Canigiani and Carlo Scattolini registered Commodore Business Machines Limited in the U.K. The Italian entrepreneurs claim to have acquired rights for the brand and trademark in the mobile industry in 38 countries, including the U.S. This isn’t the first time Commodore has risen from the dead. Five years ago, an American company called Commodore USA released the C64x, an all-in-one PC sporting an Intel Atom processor, Nvidia Ios2 graphics, 4GB of RAM, up to 1TB of storage, and a Blu-ray reader. Nostalgia and retro gaming weren’t enough, however, and Commodore USA shut down in 2013. The new Commodore PET is an Android phone of rather common design. It is well-built, with an aluminum frame and interchangeable polycarbonate covers. The shell displays a big C= logo, and a smaller one could replace the home button below the 5.5-inch IPS 1920-by-1080 pixel resolution display made of Gorilla Glass 3. The phone will feature a 1.7 GHz Mediatek 64-bit octa-core processor with ARM Mali T760 GPU and a huge 3000 mAh battery. The main camera uses a 13-megapixel Sony sensor with a bright f/2.0 aperture. It can make images up to 4096-by-2304 pixels, and videos up to 1080p HD. The front camera is an 8-megapixel rig with an 80-degree wide angle lens. Both can be operated with the dedicated shutter button on the right side of the case. The PET has dual-SIM 4G connectivity. Other custom functions I spotted include a nice implementation of Daydream (the Android feature that lets you choose what information appears on the display during charging) and system gestures that let you interact with the phone by shaking it, flipping it, or waving at it. And of course there will be a guest mode. Although nostalgia is not the core of the product, there is of course room for retro gaming. The Commodore PET runs a custom version of Android 5.0 Lollipop and two preinstalled emulators. They weren’t finished on the prototype I used, but I’m told they’ll be customized versions of the VICE C64 emulator and the Uae4All2-SDL Amiga emulator. The team also is working with unnamed software houses to bring some of the 1980s’ best games onto the PET before shipping. When it launches later this week across Europe, the Commodore PET should come in two different versions, a light one (costing around $300) with 16GB of storage and 2GB of RAM, and a regular one (costing around $365) with 32GB of internal memory and 3GB of RAM. Both will have a 32-gig microSD card included—though the dedicated slot will support cards up to 64GB, too. Users can choose a white, black, or classic biscuit-beige case, though I’m told green, blue, and other colors might be added. Initially, the PET will be available in Italy, France, Germany, and Poland, with plans to add more countries in Europe and America in the near future. It’s an inarguably niche device, but at the very least proves that technological nostalgia is an incredible—and very cool—thing.